1. The draft restoration maps show the potential project features. We've included an interpretation guide at the beginning to help you analyze them in the context of what matters to you. Remember that these are just draft proposals. The only decisions that have been finalized are the general project areas, which LPLA and other local partners prioritized after identifying cost constraints. However, all other project features are subject to change. Click here for general feature interpretations. 2. Public input questions to think about and discuss with your community beforehand. Since the restoration project is officially designated as a habitat restoration project, all the features need to benefit habitat goals and objectives. However, some features will have ancillary benefits (or costs) to other social interests. These questions highlight some of those tradeoffs that will require public input. Click here for a printable version. If you have an opinion, we encourage you to express it at the public meeting. If somebody else has already expressed the same opinion, then say it again. It is important to reinforce the public interest. (If you cannot attend the meeting or are nervous to speak, please submit your comments to us beforehand. Contact us at info@lakepepinlegacyalliance.com. 3. LPLA stance is included within the public input questions. Ultimately though, we represent our communities, which is why we would love your feedback. Again, contact us at info@lakepepinlegacyallinace.com. 1. Should this channel plug be installed? "CP Channel Plug" in Catherine Pass/Bay City Area. Description: This feature would completely cut off flow from Wisconsin Channel. Ideally, the channel plug would be constructed to a width that would create a stable shoreline while maintaining some of the deep water on the north side to offer some bathymetric diversity to the area. Benefit: Plugging this pass would cut off sediment flowing into the back bay. The WI DNR analysis suggests that the project is more likely to achieve goals and objectives if plugged. Doing so is also expected to extend the project lifespan. Cost: Plugging this pass would eliminate a popular fishing location. Recreational and professional fisherman have commented that this is a common hot spot. It is also a fish spawning area. 2. Are these features maximizing benefits to Bay City? How much should the project prioritize access to Bay City? "CP Island 1 & CP Island 2" (& Access Channel, not pictured) in Catherine Pass/Bay City Area. Benefit: The Army Corp of Engineers (ACOE) will need to dredge an access channel into the area. They are not legally able to construct an access channel directly to Bay City, but they can choose a location that maximizes accessibility. The features proposed here could be designed to protect the access channel and hopefully, increase its lifespan. Of course, it would be up to Bay City to finish the connection. Cost: All features add to financial costs. Also, the area will still be susceptible to incoming sediment and it's not clear that Bay City will or can support efforts to complete access to its community. 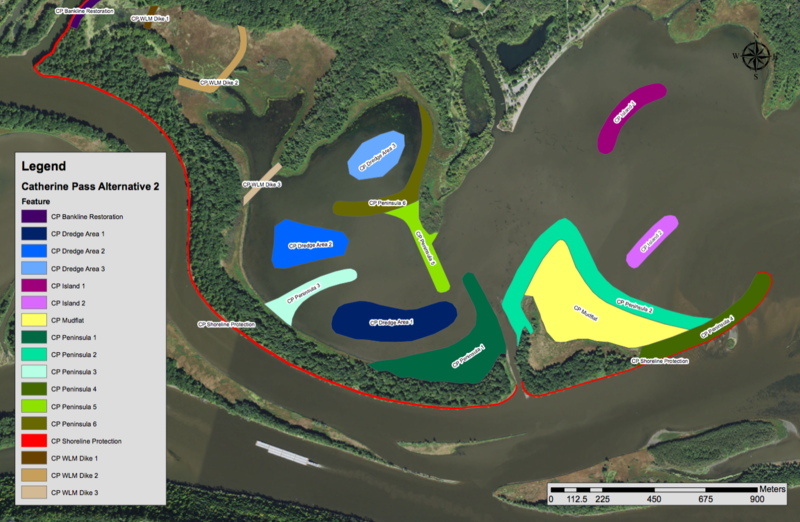 LPLA Stance: We support restoration that coincides with increased recreational access as much as possible, including the strategic placement of an access channel and creating islands or other features that will extend its lifespan. It is critical to have the public support for this effort. So, if you agree, make yourself heard…over and over again. Benefit: Extending the island would provide ancillary benefits to recreational users. It would serve as a navigational guide for boaters susceptible to boat groundings in the area. Depending on its design, it could also be used for recreation. Cost: If implemented as an additional feature, it would raise the total project costs. If substituting another feature(s), it is unclear which ones and what the effect would be on official habitat restoration goals and objectives. LPLA Stance: We support adding this island extension (or a similar feature) to the final restoration plan. It will take strong public support to make this change. So, if you agree, make yourself known. 4. Would you support some of the new islands or features being used for recreation? Benefit: It could provide a new recreational hot spot in Upper Lake Pepin. In doing so, it may attract and retain visitors to the area, thereby supporting local tourism. Cost: The feature would not be protected for fish and wildlife habitat. Management and oversight might be needed, which would require time and money. Possible congestion concerns, depending on project design. LPLA Stance: We support the use of recreation on, at least, one new island or feature. Final plans are needed before we can determine how many or which projects features would be suitable. Our criteria would include island construction, accessibility, and environmental cost. 5. Catch all questions: Are there features you think are missing? Issues not being addressed? Or problems not accounted for by certain features?